No it wouldn't and for two bids you need two contracts. If nf wasn't one of them who is left gillig? Basically, this has nothing to do with electric buses, so I'm no longer pursuing it. Stay on the topic. Sadly now days it's not too many bus manufacturers left besides NF, Gillig, Nova, and Eldorado right??. I personally wish Flixibles and Orions were still in business. Those buses looked nice and were good buses too for the authorities who ordered them. If you want to get back to topic, there are Proterra and BYD. But 1000 electric buses is not practical if you are staying on topic. Gillig and Eldorado just dont seem to have the resources to deliver more than a couple hundred per year if that. The two big hitters are Nova and Nf. If a bid was split two ways those would probably be the two winners. But even Nova can't seem to build more than 200-300 a year. NF is like wal mart. You have the St Cloud/Crookston north assembly plant, the west coast assembly plant that nabi was using I suppose, they probably are putting the anniston, alabama main ex nabi plant to use. I did see nf artics being delivered through memphis going north. How can you beat 3 assembly plants? These guys are unbelievable. They can do 1000 bus contract from cta, do a Septa order and an Mta order at the same time and all 3 of those TA's order a lot of buses. But 1000 electric buses is not practical if you are staying on topic. Up to 45 Electric Buses. Or as CTA said in the Press Release,25 to 30. Diesel buses are not part of this topic. Well I was commenting on your comment that said any 1000 bus split order would be between proterra and byd. You apparently missed the subject of my conversation which was a 1000 diesel bus order. But I said I wasn't going to engage you further in an off topic subject than I already had. Now, if you want to start a topic on your anxieties about manufacturers' manufacturing capacity (and have verifiable sources for it), go ahead. I also ask that you not misrepresent what I posted, as you have again. I only said or implied that Proterra or BYD could bid on this subject, which was up to 45 electric buses. So, let's keep this topic to the electric bus requisition. Of course, one would have to wonder if ordering such a large number of electric buses would be prudent. Yes, I say large because nearly 50 buses may be an issue if.... if the cause of this was a Li-Ion battery explosion and fire. Of course we won't know the cause of this fire unless someone at CTA would release the cause(which they never do to the public). Electric buses aren't an unproven technology, many cities around the world are now converting to electric fleets. LACMTA is purchasing 95 40- and 60-foot buses for the Orange and Silver lines from BYD and New Flyer. New York City MTA is purchasing 10 test buses from BYD and Proterra. Seattle/King County Metro has 3 Proterras, with 20 on order, and another 50 options. Shenzhen, China is apparently operating over 5,000 electric buses, and 116,000 electric buses were ordered across China last year. We really don't know what caused the fire, as CTA hasn't publically addressed the issue. It's probably also fair to note that electric buses also have fires like diesel buses (although, I don't know the rates), but I think 45 buses is a good start to measure effectiveness. 45 buses should be enough to completely electrify a couple of bus lines. They do have benefits, like better acceleration and lower energy use. I think we are still a little ways off from totally reliable electric buses but there getting close. What bothers me is mostly the extra cost per bus and we don't really know the viability of the batteries. What is the oldest electric bus age. 5 years? Do the cells degenerate over time? Example: My cell phone doesn't charge as good as when it was new. It won't hold a charge and dies quicker. The fire risk. Has a bus been in service long enough to weigh the risks. What happens if a tower is struck by lightning with a bus attached? All good questions that we don't know the answer to. So they can just take baby steps. One thing that interests me was that Seattle was supposed to go all hybrid. Now that seems like a more plausible direction as far as cost savings. What can 45 buses save you cta? That's 2 percent of the fleet. I understand to move forward we must try new things, but the risk elevates when we increase bus orders. Maybe they should have went with 10 buses or even 25 but 45 sounds a bit much. How many hybrids could they buy with a budget for 45 electric buses? I just feel they are sticking their neck out let's just hope they don't end up losing it. Again it gets down to that the grant was for the difference in cost between 25-30 electric buses vs. the same number of diesel buses. Unless you can find another way of repurposing an air quality grant than CTA did here, the federal money goes elsewhere, such as installing more traffic signals on Dundee Road. But you keep ignoring this context, including that the reason this money became available was that CTA decided it was not worth it to convert 33 diesel articulated buses to hybrid. With diesel fuel prices being about half what they were 5 years ago, the $200K more to hybridize a bus no longer is a savings. It seems like @Tcmetro gave a good overview of the considerations. Aside from the reports that LACMTA wants to have an all electric fleet by 2030, there are stories, such as this one, that LA and other major cities intend to bar all gasoline and diesel vehicles from parts of the cities by 2030. Which gets to the point that LA and other major cities in the western parts of the US have historically had higher air quality concerns than in the rest of the country. Hence LACMTA having an all CNG bus fleet, SF Muni having a sizable electric trolleybus fleet and replacing its diesel fleet with hybrids, and Seattle's King County Metro having a large electric trolleybus count and having the distinction of being among the first major city TA's in the US moving toward hybrid buses being a huge portion of its bus fleet. If anyone wants to read tea leaves, the revised solicitation says there are site visits at Chicago and Austin, Chicago Garage, and Navy Pier. The download is a PowerPoint showing placement of en route and garage chargers for route 66, and then using them on other routes out of Navy Pier: 2, 29. 65, and 124. 5 pilot buses in 2018. Other thing mentioned was that the plan contemplated 45 mile range with topping off en route and full recharge at the garage, but that would be about half of what 701 was supposed to do. In a related development, the New Flyer is now called the Xcelsior CHARGE, and they claim a range of up to 284 miles, compared to about 90 on the current CTA bus. Was reading on chistreetsblog that as part of the rfp on the up to 45 contract that cta wants to order 5 buses for a test on Chicago avenue. They want to test chargers at Chicago garage and at the terminal ends. 15 more would show up later in the year. The 25 additional are options that have yet to secure funding. Interesting. Seems they are planning this for this year. About the only thing new there is to start with 5, The repurposed grant was for up to 30. If CTA is going to get anything this year, the contract probably has to be approved at Wednesday's board meeting, but it doesn't look like the agenda will be posted until Monday. ...Seems they are planning this for this year. The agenda is up, and this isn't on it, so my betting is that either Streetsblog didn't know what it was talking about, or you took the wrong inference from it. Something is going to have to replace the 6400s. That and this 54a axing will help in that regard. Something is going to have to replace the 6400s. Most of the grant documents said in 2019. Only thing documented for late 2018 was the 25 8325s. That and this 54a axing will help in that regard. The report said 8 fewer CTA buses, and apparently at least 4 when 205 gets axed in the nearer future. June 13 agenda items for C17FT101878289 Electric Buses and En-Route Chargers $31,947,194.00 as well as several for agreements to put charging stations on Navy Pier. There is also an item for a change order on the contract for 2 electric buses, but we'll have to see what that's about. But we should see what happens by noon, Wednesday. Press Release: Proterra got the contract. Also, of interest is that the Proterra site has a crawl about adopting interoperable EV charging technology, thus conforming to the spec. I read it the other day. When the buses arrive, they will initially be tested on the #66 and #124 (the latter, currently operated out of K garage, will be reassigned to C upon their delivery). Bus fleet numbers are to be determined. Bus fleet numbers are to be determined. I would guess 702, but anything's possible. It doesn't look like anything between 100-699 is in use for buses. I'm still wondering what the $1.2 million change order to the contract for the two existing electric buses is about, as it surprised me that staff did not make a presentation to the committee on the two procurement items (as it did with the 7000s). Interoperable en route charging interfaces? 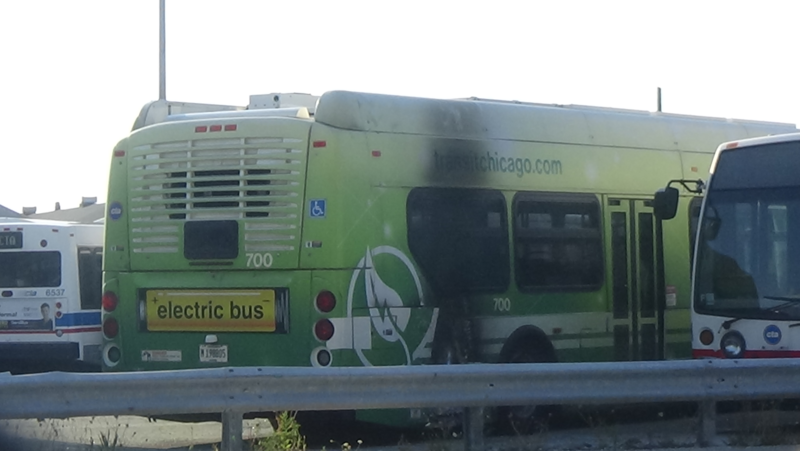 Fixing 700, as CTA insists it still has 2 electric buses? The New Flyer change order is roughly half the value of the original contract, perhaps a replacement bus?